Simple and elegant, these 9ct gold square stud earrings are perfect for wearing every day. Set with sparkling cubic zirconia, they would make a lovely gift for anyone who has just had their ears pierced. 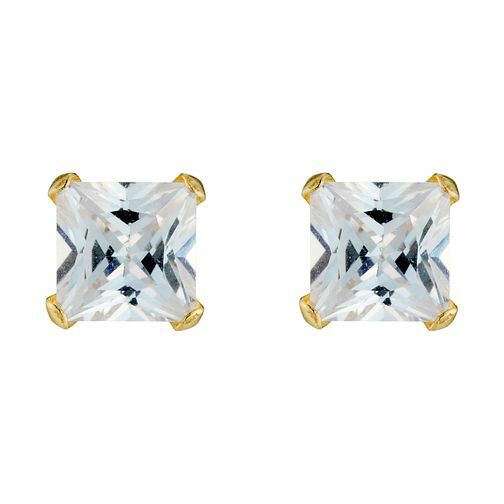 9ct Gold Cubic Zirconia Square Set Stud Earrings is rated 3.5 out of 5 by 2. Rated 5 out of 5 by Anonymous from Great This product is exactly what i wanted and what it said it was . Rated 2 out of 5 by Anonymous from Backs don't stay on These earrings are very pretty and quite cheap. I bought them to wear to work every day. However, after a week I lost one because the backs are so loose they just slide off with no resistance. I then bought a second pair but they are just the same unfortunately.